It’s out with the rebar that everyone visiting and living in Snowmass has been looking at for years — and up with One Snowmass. East West Partners and the community celebrated the beginning of work on One Snowmass, the architecturally distinctive two-building complex that will house an arrival center to Snowmass Base Village, 41 luxury residences and commercial properties on the ground floor including the new Base Village Medical Center. It also marks the beginning of sales of One Snowmass residences, with the 11 units available for sale in One Snowmass West now on the market. One Snowmass is designed to offer families flexibility of ownership with a variety of floor plans and layouts. The residences range in size from 1,620-3,836 square feet in two-, three- and four-bedroom configurations. 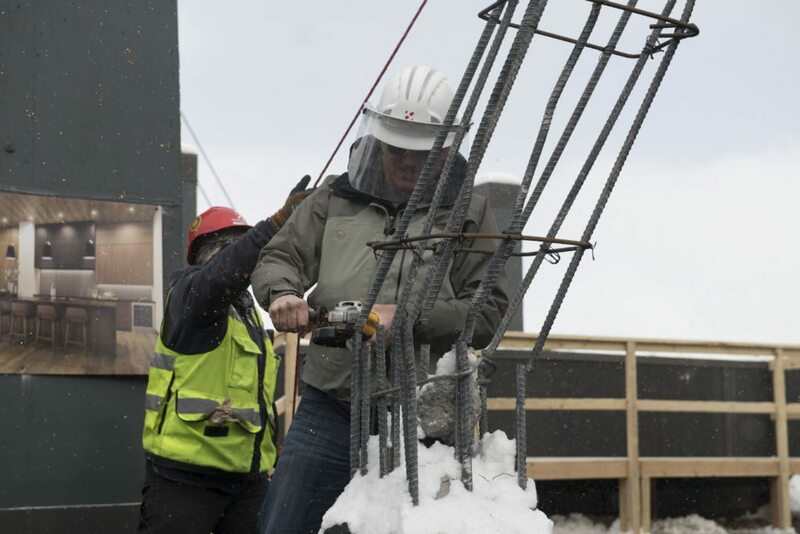 One Snowmass marks the fourth and fifth buildings to go under construction at Snowmass Base Village since East West Partners, the Aspen Skiing Co. and KSL Capital Partners acquired the project about one year ago. It is part of the over $600 million Snowmass Base Village project being completed by the all-Colorado ownership team. The design and construction teams — 4240 Architecture, Styleworks Interior Design and Haselden Construction — are also all Colorado-based. Construction is expected to be complete on One Snowmass in fall 2019. “Living at One Snowmass will mean being closer to all activities on the mountain and at the new Base Village, while still offering the privacy of a spacious residence,” said Andy Gunion, Managing Partner of East West Partners. The two-building complex, with a glass walkway connecting them, features a mountain contemporary style that updates the Aspen area’s iconic 1960s ski lodges and mining architecture with distinguishing sloped rooflines and a strikingly contemporary façade. The design is meant to usher in a new architectural era for Snowmass Village and the dynamic Snowmass Base Village that is rising up with it. One Snowmass is pursuing LEED Gold certification and Certified Healthy designations to ensure energy efficiency and the healthiest living experience possible. The building has rooftop solar panels, increasing the building’s sustainability. One Snowmass is ideally located close to all the activities at the new Snowmass Base Village, including the ice rink that turns into a summer events lawn, pop up children’s fountains, a five-story climbing wall on the façade of the Limelight Hotel, fire pits, live music, restaurants and more. One Snowmass also boasts effortless access to all the mountain’s activities and offers true ski-in/ski-out residences with private ski locker rooms for owners. There is also a private, 2,500 square foot fitness center for owners adjacent to a yoga studio that is planned as part of the commercial space. Capping it off is the rooftop terrace with fire pit and infinity-edged spa. The commercial space will include potential restaurant and retail spaces, along with the yoga studio and the new medical clinic. One Snowmass will also provide an arrival center for visitors with an updated transit center and a check-in lobby for Base Village owners and visitors. Completion of One Snowmass will also finish the now partially completed garage, allowing full use of the Base Village Garage for the first time. It will also be home to four employee housing residences, two 2-bedrooms and two 1-bedrooms.